"I left with my head held high. I’ve never slagged off the show, nor would I." 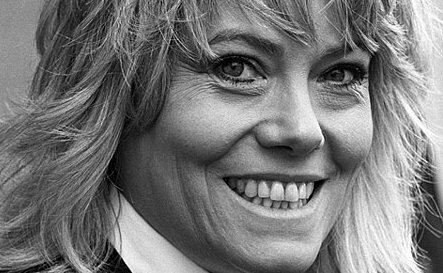 This interview with Wendy Richard was previously published on Teletronic in 2008. No trip to London for me is complete without a visit with Wendy Richard and her partner John Burns at their “local” (Britspeak for favourite pub). Tucked away on a corner street, this hideaway bar is located off Edgware Road, a busy section of central London. The pub is far smaller than the Queen Vic. Awaiting their arrival, I was treated to the jukebox blasting my favourite British hits of the 1980s from the likes of Frankie Goes to Hollywood, Duran Duran, and Culture Club. We hadn’t seen each other in three and a half years, and much has happened for all of us since. Wendy finally left the series in November 2006 after nearly twenty-two years continuously playing Pauline Fowler. But with the U.S. public TV stations nearly five years behind the U.K. storylines, the character would be with us as long as the show is still on the air. John arrives first at the pub, holding the lead of their new, well-behaved year-and-a-half dog, Lily. A tanned Wendy soon after entered the pub, and she explains that they had just returned from holiday in Malta. She tells me she’s loving the freedom of not being tied to EastEnders, and has regularly appeared on various TV programmes since. EastEnders still means a lot to her, and she notes she declined the BBC’s offer for a farewell party, and instead held a "thank you" do in July 2007 at her own expense for the crew whom she worked with over the years on the show. Among the 120 attendees to her event were the behind-the-scenes workers, including sound, camera operators, props, costume and set designers, all whom are key in mounting a successful series and seldom get invited to industry events, she notes. A few of her acting colleagues showed up as well, including Todd Carty (Mark), James Alexandrou (Martin) and Natalie Cassidy (Sonia). "It felt right since I resigned," explains Wendy. "I left with my head held high. I’ve never slagged off the show, nor would I. I have too many friends on both sides of the camera." 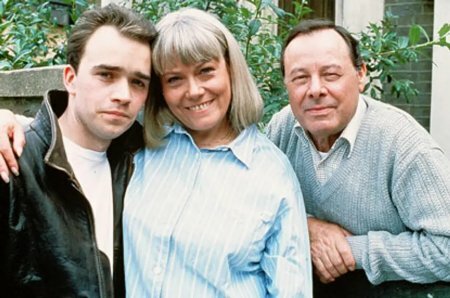 John and Wendy also recently appeared on a game show called All Star Mr & Mrs. She received favourable newspaper reviews the week of my trip for a sitcom, ITV1’s sitcom Benidorm, playing a loud-mouthed, rude, wheelchair-bound character. The morning after our meeting she appeared as a special guest on the Paul O’Grady talk show. At the pub, Wendy pets Lily and says, "You’re going to be on telly tomorrow." Sure enough, Lily was on the show. 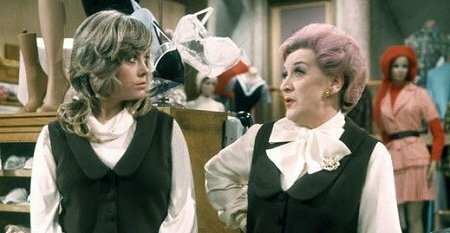 Wendy’s also starring in the pilot of a new series called Here Comes the Queen, produced by David Croft, for whom the actress co-starred as Miss Brahms in Are You Being Served? Wendy tells me with pride about how Natalie Cassidy was in rehearsals for a West End-destined play, Chekhov’s The Cherry Orchard, in which she will be co-starring with Dame Diana Rigg, and how her now-svelte former EE colleague recently had a best-selling fitness DVD. Both she and John watch a lot of American television, with their favourites being The Sopranos, Mad Men, King of Queens, and Family Guy. I thank Wendy for telephoning my mother last December, and offering words of encouragement on breast cancer. Little did I know that would be our last meeting in April 2008, and I deeply regret that Wendy did not get to see herself on the cover of my book, Albert Square & Me: The Actors of EastEnders, with the Queen and Barbara Windsor, photographed during Her Majesty’s visit to the EastEnders studio in Elstree. Perhaps my most interesting personal relationship with an EastEnders actor has been with Wendy Richard. How it came about was somewhat unusual. One day in early 2000 I received an email from John Burns, then Wendy’s boyfriend, later her husband, saying that they would be in New York and would I fancy a drink? I was surprised, since over the years her agent had repeatedly turned down the requests that my former business partner and Walford Gazette co-founder Dan Abramson had made for an interview. When I arrived at their Upper East Side hotel, off Central Park, I was half expecting to be read the riot act about something that had offended her in the Gazette. Wendy was glad to hear that I had been selling the hard cover of her autobiography, which had been published earlier in the year. In fact, her book was selling way faster than the memoirs of either Barbara Windsor or Mike Reid, both issued around the same time. This surprised me somewhat because I thought that Peggy and Frank were more popular characters. I kept that first meeting casual (I never pulled out a tape recorder or notebook), which seemed to be what Wendy preferred. Interestingly, that was how the relationship remained over a half-dozen or so meetings in New York and London (at her local pub, the Beehive in Marble Arch) that she, John and I would have in the ensuing years. I never did a formal, career-spanning interview with her, which I now, of course, regret. Wendy was always friendly, and asked about my family, whom she met in 2001 when I organised a dinner party in her honour with about 15 New York-area fans at a good Indian restaurant. Wendy was always quick to offer support or a first-hand quote when something came up in the U.S. regarding EastEnders, such as the BBC America cancellation in September 2003. And she also told me how devastated she was by the 9/11 attacks. New York was their home away from home. I once gave Wendy as a gift a rare promotional DVD of Everyone Loves Raymond, her favourite American TV show. I realised that it was largely because of John Burns that I had such a great relationship with Wendy. He was constantly thinking of ways for her to get closer to her many fans. In fact, a few years ago John and I discussed the possibility of mounting an EastEnders convention in the U.S. with Wendy as the star attraction. Sadly, that never came to fruition.